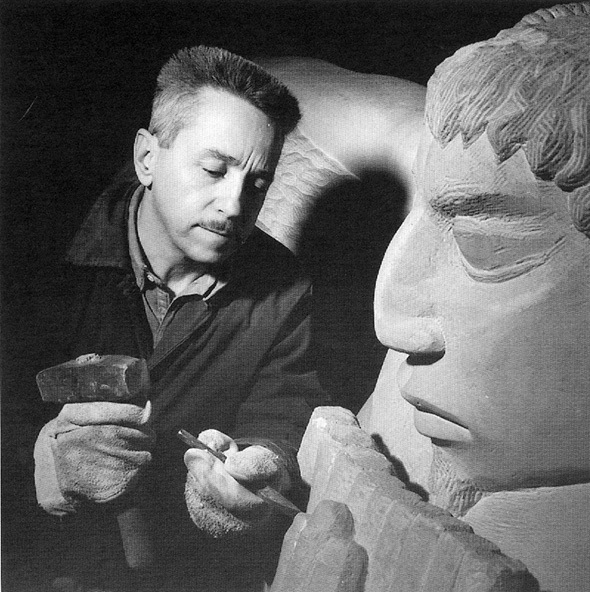 Mythical Toronto sculptor Elford Bradley “E.B” Cox (1914-2003) would likely be appalled to see what has happened to one of his greatest collections of work – The Garden of the Greek Gods – donated to the City of Toronto and displayed at the CNE since 1979. 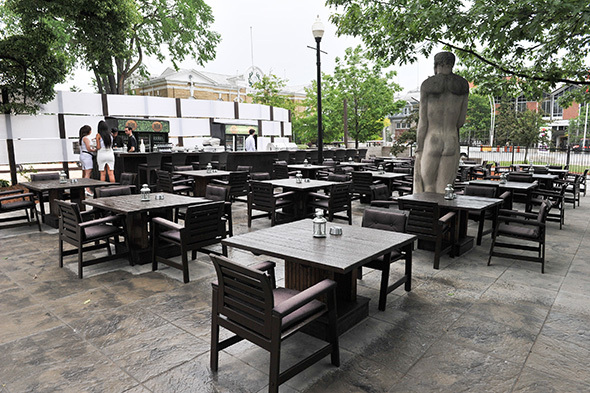 Nightclub Muzik has absorbed almost all of them as part of their extended patio, and these historic Canadian sculptures are now off-limits to anyone not frequenting the property of this 19+ only bar. Their intended audience – children – can no longer interact with them at all. 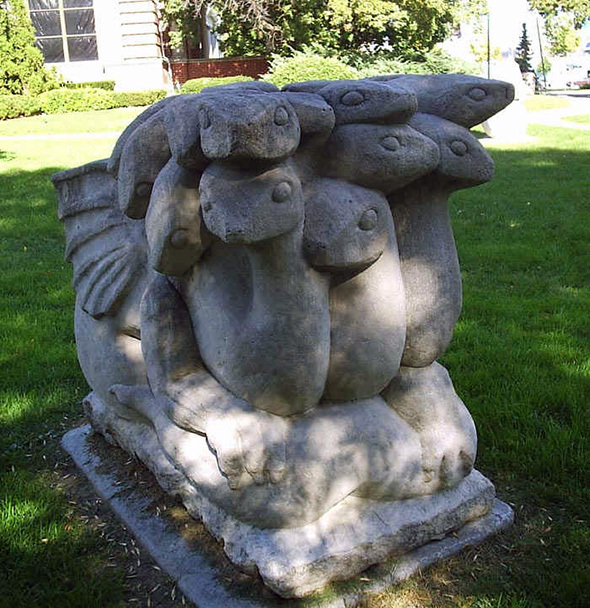 Aside from losing these beautiful public sculptures to a private establishment, it’s troubling to imagine them as impromptu perches for Smirnoff Ice and Bud Light Lime. E.B himself is weaved through the fabric of our Canadiana art tradition – he was close friends with Barker Fairly and the Group of Seven, carving their headstones as they passed away; he was friend to the late Farley Mowat, chronicler of the Great North; he taught French at Upper Canada College to sonic maven, photographer and filmmaker Dan Gibson; he portaged with Omer Stringer, legendary canoe sensei and creator of the Beaver Canoe line. E.B was a proper old-school artist from a golden age that celebrated the Canadian nature experience, equally influenced by Iroquois and West Coast Haida styles as he was by classical Roman sculpture. The E.B Cox aesthetic was entirely and uniquely Canadian. 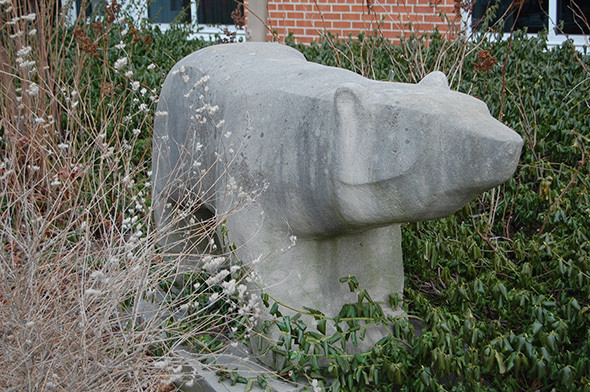 From small animal carvings made in wood (he is often credited with starting the boon in coffee table art) to limestone behemoths in public places, E.B had an almost supernatural ability to capture the essence of a subject in his sculptures. Described by art historian Gary Dault as “The Mark Twain of contemporary art,” he famously never took a penny in government grants for his artistry, nor did he suffer elitist, effete art snobs. He was a man of the people, and interaction between the public and his statues was of paramount interest to him. The 20 pieces in his masterful Greek Gods series (Hercules, Mermaid, Cyclops, Boy on a Dolphin, Pan, Aphrodite, The Three Graces, The Harpies, Cerberus, The Hydra, The Typhon, Medusa, Orpheus, The Minotaur, Centaur, The Phoenix, Sea Horse, The Sphinx, The Triton and Narcissus) were originally sculpted in the 1960s for a resort in the hills at Georgian Peaks, however E.B was reputedly disgusted at their hilltop placement, as it meant people only saw them during the skiing season. He bought them back in 1974, committed to finding them a home where they could be marvelled at all year round. 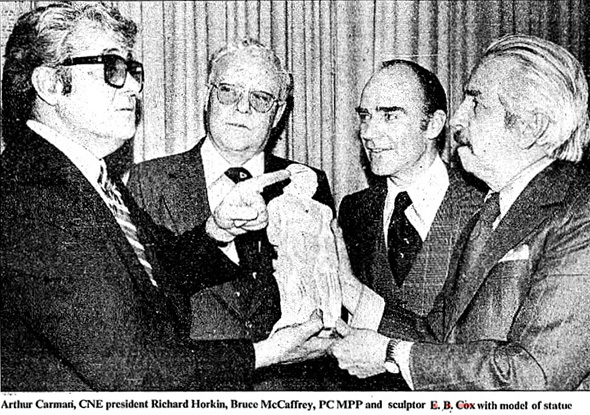 In 1978, an E.B Cox fan, Toronto restaurateur and all around celebrity magnet Arthur Carmen bought all 20 statues from E.B and donated them to the city and people of Toronto where they were to be proudly displayed on the grounds of the Canadian National Exhibition south of the Horticulture building, near the Dufferin gates. E.B would often appear at the CNE, carving wildlife statues out of butter at the Food building (such fare passed as an attraction before exploitative food stunting like the Cronut burger and its ilk became the de facto marketing tool). Over the last 30 years, the statues in the Garden of the Greeks Gods have entertained anyone who travelled through this part of the CNE grounds. 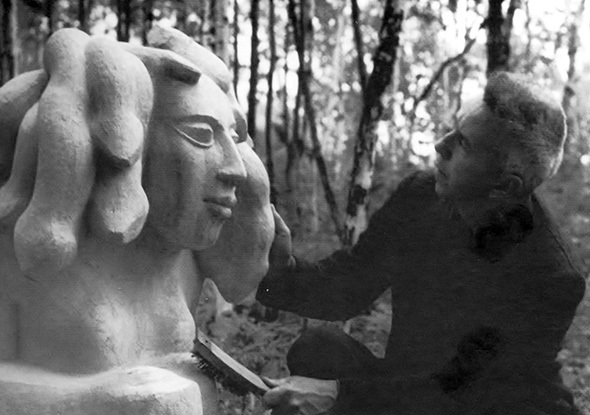 “What I am happiest about is that my statues will be available to the public, and to kids especially,” E.B told the Toronto Star at the ground breaking ceremony for the Garden in 1979. “They’re not dainty things – all limestone – and kids can climb on them all they want”. What does it say about our culture that these magnificent pieces are allowed to languish, some completely out of sight, seen only by the likes of Muzik owner Zlatko Starkovski as a bothersome obstacle in the expansion of his nightclub? It is absolutely shameful that, at the very least, the statues were not moved before the City granted Muzik its cozy licence, and then went on to entertain nonsensical demands such as a ban on all-age parties on the grounds of the CNE. As tempting as it to wish the statues might come alive, Golem-style, and extract bloody vengeance on those who see fit to disgrace them as glorified ashtrays, it’s also reassuring to remember that the Greek God statues will outlive the current occupant of the space they pre-date. E.B used to joke that his stone work will still be there long after Rembrandts’ paintings had crumbled. And it’s true.